Here was my day in a nutshell: got up, fished, ate breakfast, went to town, ate lunch, fished, took down a tree, fished, started up our boat (that had been dormant for two years), fished, ate dinner, and fished. All in all, I probably fished for about 9 hours today. In the morning, from about 7-9am, I threw a bubble gum fluke, white spinnerbait, blue Booyah jig with blue speckled Zoom chunk, texas rigged Slurpie worm, scum frog, and mimic minnow swimbait with spinner. I only got hit once, but it was a good thump on the mimic minnow swimbait. When I set the hook on it, it didn’t feel very good and the fish let go. I cast a bunch more times in the area, but didn’t get another hit. After lunch, from about 12:30-1:00pm, I only threw a couple of lures before I heard my dad start the chainsaw, so I went to help him. I noticed, however, that conditions were getting good for fish to off our dock. The sun was out and there was a decent breeze blowing right into our shore, creating a nice chop on the water. If I were a stranger to the lake, I would fish our shore and cast under our dock. At about 2:00, I got to fish for another hour. 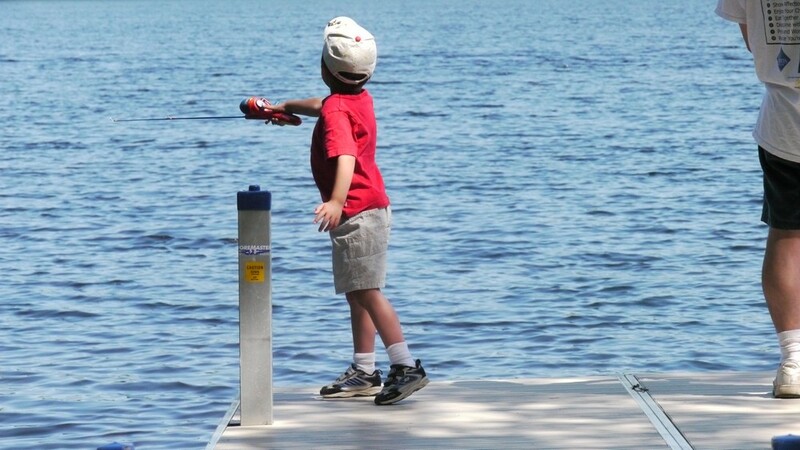 While I fished, my son practiced casting with his Spiderman rod and reel and plastic fish plug. I tried a variety of baits not unlike in the early morning and got thumped on the blue Booyah jig and pig, not far from where I got hit in the morning. That time, I thought I got a good hook set, but the fish must not have bit all the way to the hook because it disappeared after a few tugs. Since mid-morning, we were waiting for a battery to charge so we could try to start our boat. The charge finally finished, so I took another break from fishing to try to get the thing started. Miraculously, we succeeded. I hadn’t been to my dad’s place for about two years and it hadn’t been started since then. At about 4:30, I went back to the dock. Again, I tried a variety of baits and got another hit on the mimic minnow. This time, I knew I got a good hook set. My son was with me again so I had him help me. He didn’t reel at all, but helped me hold on to the rod so he knew what a fish felt like. It splashed on the way in, so I thought it was a bass. When it got close enough to the dock, I told my son to get my wife to bring down a camera so we could get a picture. When I first saw it, it looked big. But then I realized it was longer than a bass. It was a muskie! I got it to shore and we measured it at 24″. After all the picture taking had finished, my son and I went back to casting. I decided to walk down the shore a bit to an overhanging tree. My mimic minnow was all bent out of shape from it’s battle, so I put on a yellow beetle spinner with a split tail. I dropped it under the tree and got another hit. I tried to set the hook, but all that came back was the spinner! I want to say it was a huge muskie that took it, but upon closer examination, it appeared that the wire holding the head failed and broke off. It was very disappointing to say the least. But that would be the extent of the excitement for the day. After dinner, I fished from about 8-9:30 with just a few little ticks on a yellow jighead with a yellow grub. I was under the overhanging tree again and it must have been little fish because I could see the tail disappear, but not much else. Overall, not a terrible day of fishing, but it would have been nice to pull in another one of the thumps. Busy day, but, all is well that ends well. 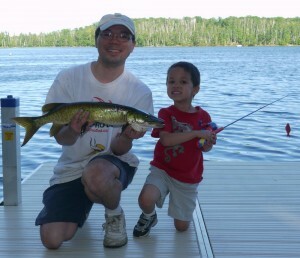 Great fish and you got the boat started and fished with your son. I will take that any day. It certainly wasn’t a bad day, Mel. I’ll always take more fish on the line, but I can’t complain. Sounds like a good time! I was up at the cabin and we took a hike to Topper to fish from the shore and also tried a little on Mayhew with no luck. Great weekend though! Hi, Heidi! I knew you were lurking around here. Glad to finally see a comment from you. Also glad to hear you had a great weekend. But you went home too early! Actually, Optimista, I took down two. I should have had my dad take a picture. I like this entry ~ Fish…do things…fish some more….things…and more fishing! Can you imagine if your son had caught a big old muskie on his little spiderman pole. That would have been a real kicker. All and all it sounds like a wonderful day. My son is a bit too unpredictable with his casting yet, which is why he only had a casting plug. My 9 year old daughter, however, was using a white spinnerbait. She doesn’t have as much fun casting, so she wasn’t out there as long. I can’t wait til she catches something on it.